Carrington is celebrating after winning at the Future Textile Awards in the Protective Textiles category. 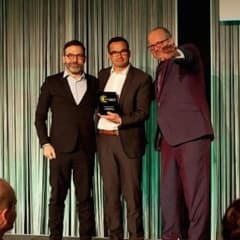 One of Europe’s largest workwear manufacturers, Carrington was recognised at the prestigious ceremony in Frankfurt, Germany, for its innovative Flameban Max 310 Hi-Vis Orange fabric. Flameban is a breakthrough protective fabric as it possesses both hi-vis and flame retardant qualities – it also remains lightweight, durable, and capable of undergoing high temperature industrial laundry washing. It is also the only flame retardant fabric to meet Network Rail standards for both weight and hi-vis protection. Flameban’s multi-norm properties are providing a level of comfort and safety in the workwear market, previously only seen with aramid-only fabrics. Kirsty Kirk, Research & Development Manager at Carrington Workwear, said: “Carrington’s objective is to pioneer advancements in worker protection and this award recognises our achievement in this vital area. “We knew that developing a flame retardant GO/RT fabric would be a long and difficult process yet we knew it was worth the investment. As a result, we’ve brought something to the market that has never been seen before. The Flameban range also includes Pro2 and Pro3 laminated versions which offer the highest level of waterproofing and breathability under European standards, EN 343 Class 3-3. Weighing just 310gm, Flameban Max also provides the wearer with comfort and ease of movement. This is the second time Flameban has been recognised, having won in the Best Fabric and Fibre category at last year’s Professional Clothing Awards in London.